43 Private Drive, Balewadi was launched about 3 years back & possession date stated then was to be an end of 2013/ mid of 2014; we have heard customers are still awaiting possession till late 2014 and the rate per square feet has increased from 5000 psft to 6500 psft in the past 4 years. If the above said is true, then it would have indeed been better for investors to deposit their money in an FD from a financial perspective for better results. However lets deep dive into the details from a macro view to see what the product is all about. Is it an investment or an end usage product. Amenities galore, the project come with 5 Luxurious multi-storied towers, Spacious 2 & 3 BHK apartments, Clubhouse with gymnasium & steam room, Adequate car parking with separate car wash area, Sewage treatment plant for the entire project, Exotic landscaped garden designed by renowned Singapore-based architect & an Earthquake resistant structure. It is said that the eastern side of Pune has people from all walks of life & better infra and more family, oriented buyers, & in western Pune there are a lot of tenants compared to the east. The prominent nearby localities surrounding this area are Baner Village, Kaspate Vasti, Vishal Nagar, Pashan Sus Road, Sutarwadi, Pimple Nilakh, Pimple Saudagar and Jagtap Dairy. Ever since the Commonwealth Youth Games in 2008, development around this location has significantly increased and so did its real estate value. 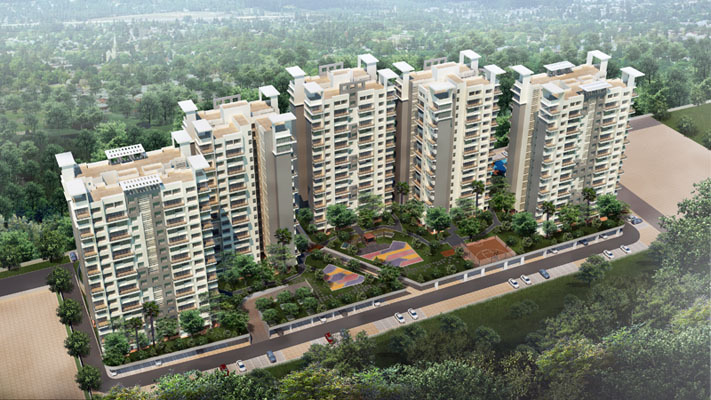 With time Balewadi has developed efficient connectivity to the major day to day requirement spots. The Mumbai-Pune Expressway falls in close proximity to Balewadi, and hence keeps it connected to all major localities in the stretch. The industrial town of Pimpri-Chinchwad is 12 kilometers from this area and could be reached in a 30 minutes’ drive while Pune main city is at a distance of 13 kilometers. Bus transport via PMPL buses is available and connects the locality to the neighboring areas. Air travel is easily accessible too via the Pune Airport (20 km) while rail travel could be done via the Pune Railway Station (10 km). 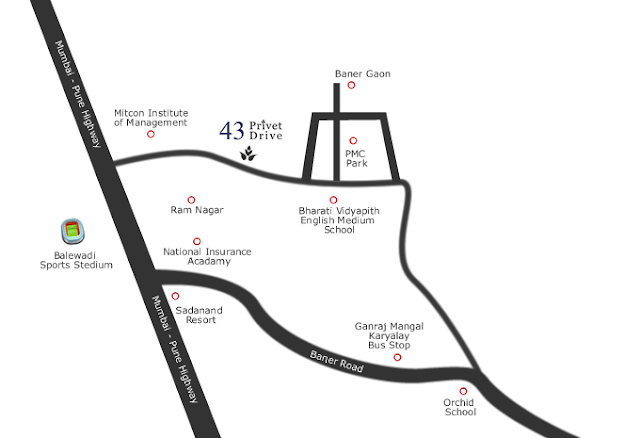 Coming closer 43 Private Drive a popular project located to the North-West of Pune, famous for Shree Shiv Chhatrapati Sports Complex and India Studio. to the plot, we would like to highlight that there is a small garbage dump opposite the project and a nullah passing through it which should worry you. The plot is rectangular in shape which is generally ideal for any plot. However, something that I really find confusing is what really triggered the developer to have 1 extra building in here. Tower C’s existence means residents in tower D & B won't get an open view. Also, the current layout ensures that only resident of tower C gets a full garden view. The amenities are well packed in which is a positive however there us a nullah passing the plot right next to tower C. I really don’t know how it's going to be maintained. There are 4 apartments per floor and 2 lifts (an extra lift would have been beneficial, but in Pune 2 lifts are common). 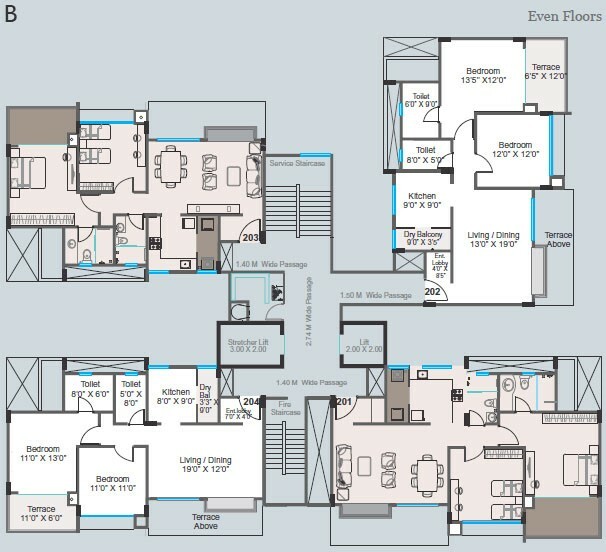 From a design perspective, the floor plans are decent. There is an entrance lobby which ensures privacy in the apartment. The living room is of size 19 *12 which is decent however there is no separate dining space which is negative. The kitchen is of size 8 * 9 and comes with an additional dry balcony space, the same is ok in terms of size, however, views from the kitchen are blocked in all apartments. The bedrooms are average sizes. The apartments come with Jaquar Artize / equivalent range single lever chrome plated finish WC fittings, additionally, the developer has given a provision for washing machine and dishwasher in the dry balcony. The apartments come with a modular kitchen with hob and chimney & the terraces come with S. S. railings with glass. Overall from a design and finishes perspective, the apartment is well laid out however it falters in the space provided. 2. There are a small garbage dump opposite 43PD and a nullah passing through. Keeping in mind the that there is immense competition in this area with Marvel and many other developers launching at much lower rates with better amenities and recreational facilities; 43 Private drive is at a back foot, the advantage it has been that it is close to possession, however, you would want to visit competition before investing.